Harry Potter and the Order of the Phoenix: Review | Phil-zine! 12:15 a.m. A couple hundred younger people are seated throughout the dark theatre. The music doesn’t begin right away as it has in the past when the logo appears. Instead a foreboding silence accompanies the silvery dark gray-blue hued clouds that hang just behind the large WB on the screen. A few people applaud, but many wait, feeling perhaps that because of the final events of the previously seen film this one is somehow going to be different. And as the logo approaches us and begins to pass Harry Potter’s theme begins and the crowded one screen theatre house on opening morning goes crazy. There are some minor spoilers here! “Dumbledore’s Army” is the name of the illegal gathering of students that Harry Potter leads in this 5th installment of the popular book turned movie series, and with “Harry Potter and the Order of the Phoenix”, like Harry growing up and learning to take control of his destiny, the filmmakers have made a stunning leap away from the kiddie-friendly adventures of the earlier films and have positioned this film as the most mature, frightening and perhaps best of the series thus far. Because of the heavier nature of the film, it’s easy to not take for granted that Voldemort is a true villain, and that in facing such a villain there are real consequences. It smartly picks up with the consequences of the previous chapter The Goblet of Fire, but I’ll get to that. Getting away from the perhaps very few shortcomings of the film, I’ll get on with the things it does better. But in order to have a wonderful finale the building blocks have to be placed from the first few moments in the film, and immediately we’re thrust into a world that has the subtlety and visual flair of some of the greatest non-adventure films of our time. It might just be me but some how Daniel Radcliffe has finally become a much better actor, one that with a glance can let you know what he thinks or feels. Maybe it’s the fact that he’s now lived in Harry’s shoes for so long, or his very revealing turn on the stages of London, or maybe Yates just knows how to deal with actors better than his predecessors, but as Harry looks on from a solitary swing at a Mother playing with her child we are reminded of everything we need to know about Potter’s lonely world. Then the clouds form and a much more frightening form of Dementors descends from the sky and we are sent spiraling into Harry’s slowly disintegrating world of Hogwart’s where he once found solace. 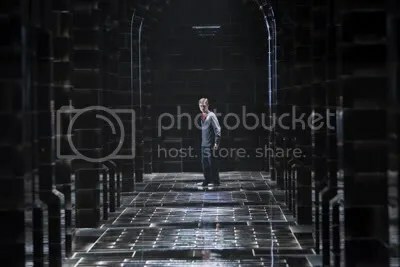 Returning he finds that not only does no one believe him concerning Cedric’s death at the end of Goblet and the return of Voldemort, but he’s facing expulsion! All this and some unexplained dreams have made him angrier…at everything. He even has outbursts toward his closest and truest Ron and Hermione, and the headmaster Dumbledore. 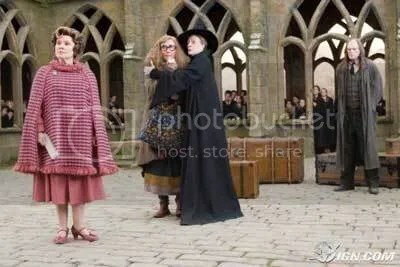 It doesn’t help that o ne of the instructors has it out for him, and this new kind of evil, the evil of ignorance, is personified marvelously in Imelda Staunton’s performance as Dolores Umbridge the new Defense Against the Dark Arts Teacher. Nice was never so frightening; her twittering giggle is enough to send a chill up the most willful person’s spine. But this brings me to one of my biggest problems with the film series now, if you can consider it a problem, is that there are so many likable and interesting characters who have been brought to the screen and by such wonderful actors that it never feels like we get to spend the time with them that we want to. 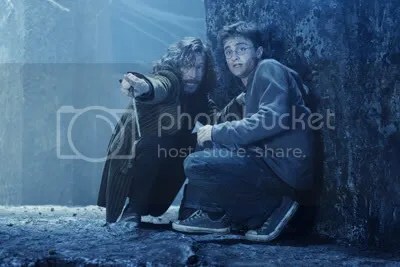 Thankfully, Sirius Black plays a big enough role in this movie so that Gary Oldman gets to have some more fun in being the only one able to help keep Harry on an even keel. We’re treated to some beautiful moments between Ron and Hermione. Michael Gambon finally comes into his own as Dumbledore and is able to show his great talents. Ralph Fiennes is even creepier in this than he was in the last…particularly in one instance just outside a subway, and all he does is stretch his neck. And the rest fall into place each being allowed a nice moment of their own (except for perhaps David Thewlis as Remus Lupin,) and the bunch includes a few new characters by some additional talented actors, the most intriguing is a villain who I will not mention, but effects Potter’s world more than any other character has thus far. In Harry’s continuing coming of age story we’re treated to some wonderful scenes and moments, a few between his first love interest Cho Chang (who is without British accent here – strange.) Actually, the most memorable is the moment everyone who has read the book is waiting for with Cho, and pay close attention to the moments after in which we see how Harry’s own experiences have begun to make him more attuned to the people around him (another wonderfully wrought moment). But this film is so chalk full of wonderful moments and casually discovered, nuanced character insights that flit across the screen so quickly at times we don’t realize what happened until a second later, and when some of these moments are achieved with a simple look, it becomes difficult to favor one over another. What runs even deeper in this book than perhaps in the others is the importance to emulate role models that are worth emulating. In Harry’s desire to grow up and take charge of his own fate his “Dumbledore’s Army” is modeled after the under ground army fighting against Voldemort, The Order of the Phoenix. In a day and age in which pop stars flash photographers and are constantly seeking drug rehab the idea to be a role model to children is that much more necessary, to be a Sirius Black to a Harry Potter is more of what is needed. 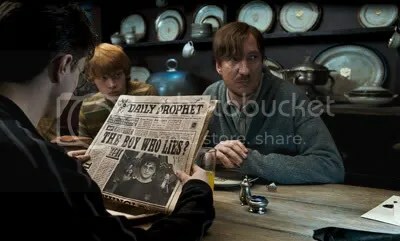 To love someone and support someone regardless of their faults or their relationship to you will cause the younger and less wise to wish to emulate as Potter does in his support of his friends and his desire to do what is right against all odds – even when he is faced with the choice of the ultimate justice. It’s also nice to see John Williams continue to keep up with each new director’s vision of what Harry Potter can be. He’s able to stretch his legs and find new ground to work on with each film. This movie was a joy and a thrill to watch. It lacks the stumblings and stutterings of many of the other blockbuster films so far this year, it actually puts most of them to shame. But I return to wondering that with so much going on in Phoenix will it be a problem for someone who hasn’t read the book. They may not understand the importance of many of the key elements…like Harry’s anger problem. While it’s mentioned directly does it have the adverse affect on his personality that it did in the book? To me in the film it felt perhaps a little too justified. I relinquish that worry realizing that instead they use it to smartly focus on the idea that a connection between our hero and ultimate antagonist has been made. 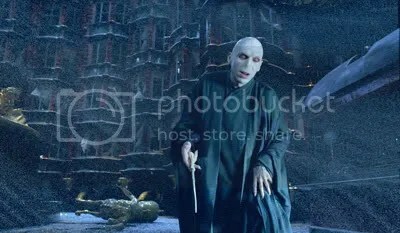 Is it clearly understood why Voldemort is seeking out the “key item”? We know he wants it but why exactly? We find out what it means to Harry in the end, but we’re not so sure how it would have helped Voldemort but the fact is that he didn’t know what the “key item” would tell him either, or if it would have been any help at all. With a little thought each problem is easily amended and no longer remains a problem. So prepare yourself to put some of the pieces together on your own. It’s all there. It just feels like the writer and director thought that perhaps the audience will be smart enough to put it together without a rambling monologue in the end to tell us why everything was so important…thank you for that. And thankfully David Yates returns for the next installment, The Half Blood Prince. This entry was posted on July 12, 2007 at 6:25 am and is filed under Current Movies and Reviews. You can follow any responses to this entry through the RSS 2.0 feed. You can leave a response, or trackback from your own site.